When reading Scriptural prophecies of Satan and his evil minions, novels, art and films often present the forces of darkness as equal to God. It would seem that as God and the devil do battle, one really couldn’t know who will win and who will lose. We suppose that makes for a suspenseful story. But how does Jesus slay and destroy the lawless one sent by Satan? 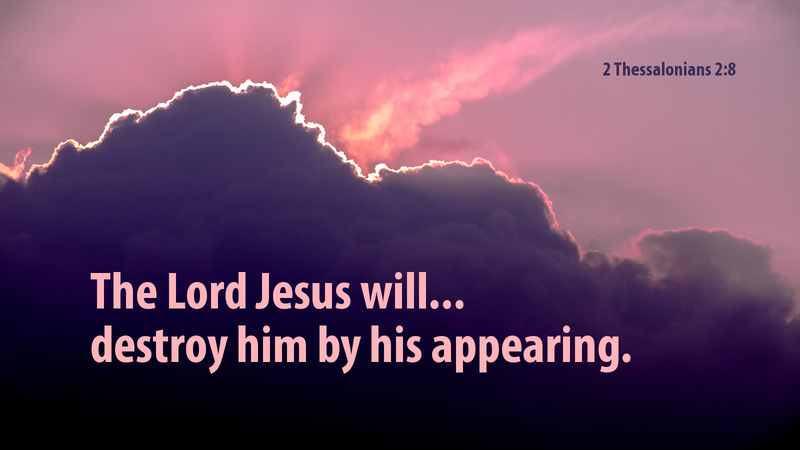 Paul reminds us that the Lord will overcome by the breath of his mouth—and merely by His appearing and coming! This is not to minimize His power. To the contrary! It affirms that God has all authority on heaven and earth, even as the Father has given it to the Son, and the Son will defeat the devil and all his agents. And Jesus will do so with a huff and a puff! The lawless one will be no match for the Son of God, as Jesus has the same breath of God which blew over the waters at creation and the same breath that God breathed again into Jesus at His resurrection. And lest we forget, it is the same breath that is the Spirit of God breathed out upon the Church at Pentecost! We need not fear Satan or the lawless one(s)—for we have the power of God at work in us! Prayer: Lord God, give us courage to trust, in the midst of evil and darkness, that with your Word, with a holy breath, Jesus overcomes sin, death and the devil. Amen. Advent Action: Do you know someone who is struggling with evil in his or her life? Ask if you may pray with and for them—laying hands on them as you pray.